Skinny jeans? Yes! Your 16 inch A Girl For All Time® doll will look great in these slim fitting pants! 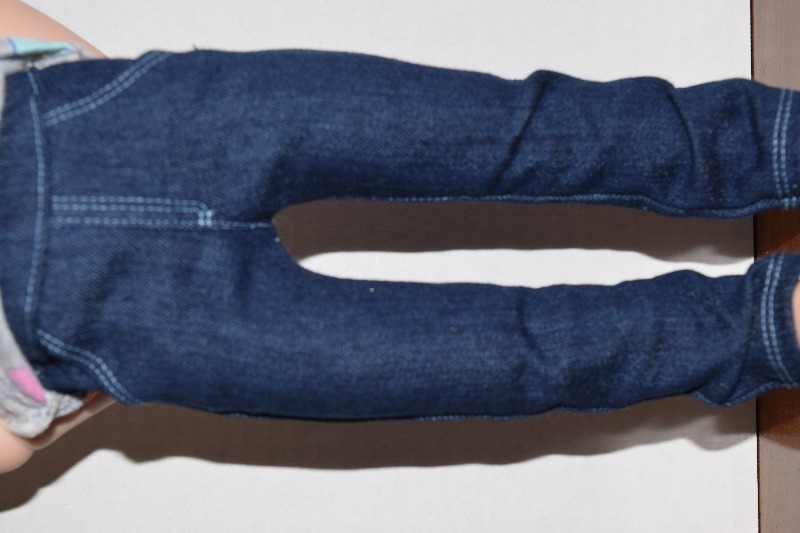 You’ll love how these cute jeans come out, and of course, if you use different fabrics and colors, you can make your doll a whole wardrobe full of choices. Design details include: a slim fit with a straight leg opening, functional front and back pockets, topstitched detail, and an elastic waist. This design is narrower than the bootcut version, through the hips as well as the legs. Bonus: Specially designed cut-off pattern is also included. A gently curved hemline creates the perfect look when worn. 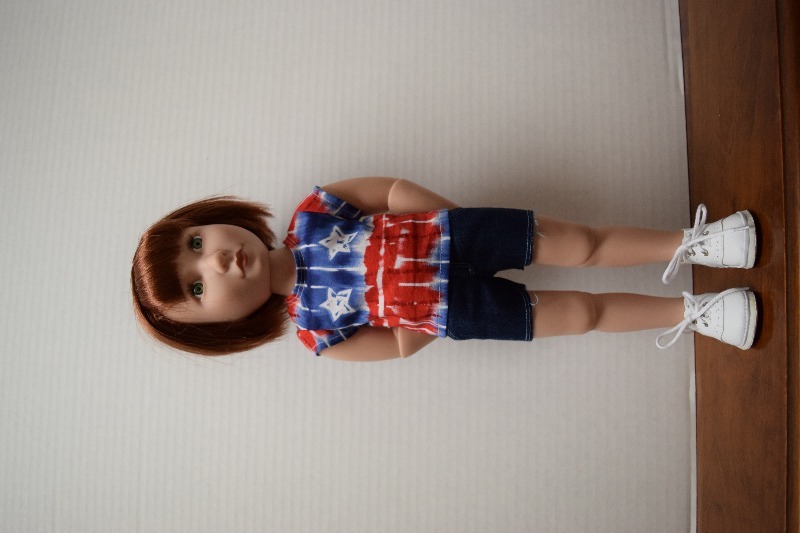 Special Note - This pattern is designed to fit A Girl For All Time Dolls specifically and will not fit the standard 18-inch doll such as American Girl® Doll. An AGAT doll is 16 inches tall and has a slimmer hard plastic body. You can see more info on our Doll Measurements page. What You Get: One 19 page sewing pattern that you digitally download as a PDF file so you can start your project immediately! The PDF sewing pattern provides full-color step-by-step illustrated instructions and full-size pattern pieces. A PDF reader is required to view and print the files (example: Adobe Reader or Preview for MAC). The download link is received immediately after the transaction is complete. Print copies are NOT available. Love these jeans. They fit so well and are fun to make. Can't wait for more AGFAT pattern releases!!! I love Liberty Jane patterns overall, especially for American Girl dolls. They need the variation in waist measurements offered by encased elastic. For A Girl for All Time dolls, though, the bodies are rigid and seem to me not to vary in size. I'd especially appreciate having patterns with straight, non-elasticized waists, with regular opening and snap fasteners rather than the ones that bunch around their tiny waists. Still, I've bought every pattern Cinnamon has published if I have that size doll to sew for, so this is not a complaint, just a wish. Maybe the high-waisted jeans could be resized, for instance, or the motopants. Great pattern!